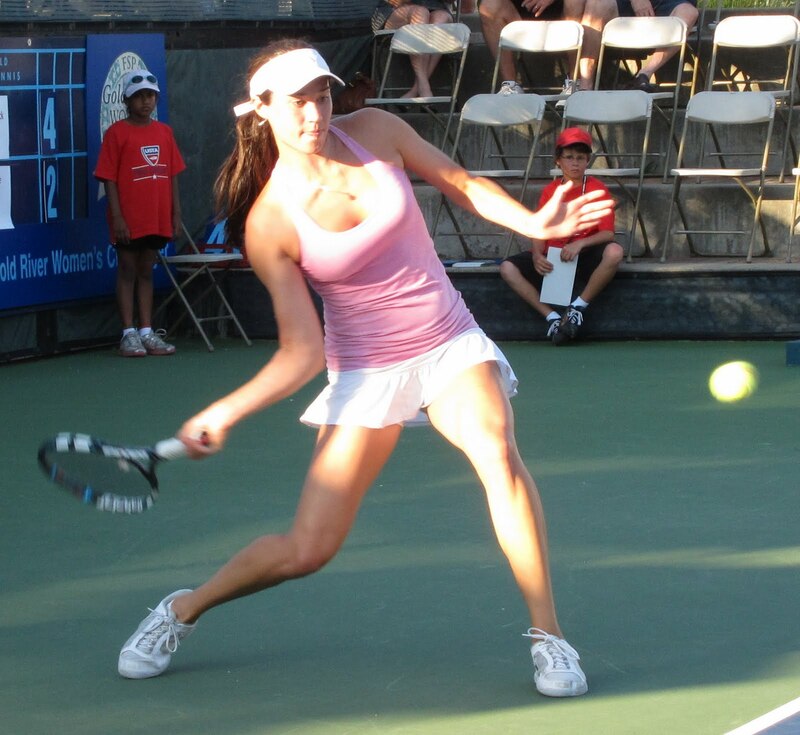 Yasmin Schnack was on her way in professional tennis. After 2 1/2 years on the circuit, the former UCLA All-American was headed toward the top 100 in the world in doubles. She played doubles at Wimbledon with her best friend, Vania King, and helped her hometown Sacramento Capitals come within two points of winning the World TeamTennis title. King, a two-time Grand Slam women's doubles champion with career highs of No. 3 in doubles and No. 50 in singles, said Monday that Schnack "is more talented than I am." None of it was enough. Weighed down by loneliness, financial considerations and family issues, Schnack retired from pro tennis last November at age 24. "I'd be going out (on the minor-league tour) for three, four, five weeks at a time, and I'd be meeting up with friends and players at tournaments, but as far as having someone there with me, my parents weren't there, I didn't have a trainer, I didn't have a coach or hitting partner," Schnack said earlier this month in Sacramento during the $2,000 Rio Del Oro Open, in which she won a three-team round robin in women's doubles with roommate and former Sacramento State standout Clarisse Baca. "After a while, it took a toll on me. I felt burned out and kind of lost that passion and competitiveness to be out there. "That was a big factor, and financially it's difficult. Your income is based solely on how you're doing. Some weeks I had great tournaments, and then for a few weeks there was nothing. You're paying for all your expenses -- air fare, hotel, food, equipment, stringing ... Everything just kind of adds up." Schnack also feels she needs to be at home. "My dad's 82, and his health is deteriorating, so my mom's at home taking care of him," said Schnack, whose Filipina mother, Candida, is almost 30 years younger than her father. "My sister is mentally handicapped, so my mom is really busy taking care of the family. ... My family is so important to me." Schnack's father, a retired physician named William, has Parkinson's disease. "It's still in the early stages, but I can really see differences with his health," she said. "Every minute I can be at home around him, it makes me feel better, and I know he appreciates me being at home and spending time with him." Schnack, 5-foot-10 (1.78 meters), reached career highs of No. 140 in doubles and No. 371 in singles. She won 11 doubles titles and two singles crowns in tennis' minor leagues. In Schnack's Wimbledon main-draw debut last summer, she and King lost to eighth-seeded Iveta Benesova and Barbora Zahlavova Strycova, both of the Czech Republic, 6-4, 6-1 in the first round. King won the 2010 Wimbledon and U.S. Open women's doubles titles with Yaroslava Shvedova of Kazakhstan. Schnack played full-time for the Capitals the last two years, along with King for 10 of 14 regular-season matches in 2011 and two during last year's march to the WTT Finals. King, also 24, has known Schnack since they were juniors. "I've always thought she had amazing potential from when we were little," the 5-foot-5 (1.65-meter) King said by telephone. "She never had proper coaching or support. She's more talented than I am. "She has the potential to be top 100 in singles and doubles, but things don't always work out the way everyone expects. 'Potential' is a very vague word. A lot of other things come into it." "She has very clean strokes," King said. "She has a great body, great physical ability and an all-court game. She has all the tools. The game came naturally to her." Maria Sanchez -- a 23-year-old rising pro from Modesto, 77 miles (124 kilometers) south of Sacramento -- has known Schnack since they were in high school. They were cross-town rivals in college -- Sanchez was an All-American at USC -- and played doubles with and against each other in the pros. "She's a great player, so it's sad to see her go, and she's also a good friend of mine," Sanchez said last week after winning her singles main-draw debut in the BNP Paribas Open at Indian Wells. "But you have to do what makes you happy." Even if you're approaching the top 100 in doubles. "Everyone was saying, 'Your ranking is steadily going up. Why are you stopping?' " Schnack said. "I guess I really didn't think about my ranking so much as how I was feeling. Did I feel good on the court? Was I having fun? Was I enjoying it? Was I competing? "Most of the time, I was just fighting myself. Tennis is so mental. You're putting yourself at a disadvantage if you're fighting yourself and not playing against your opponent." Schnack's case is reminiscent of Sam Warburg's. Also citing loneliness and financial struggles, the Sacramento product retired from professional tennis at 26 in 2009 after 4 1/2 years on the circuit. Warburg approached the top 100 not only in doubles with a career high of No. 117, but in singles, peaking at No. 132. He played five seasons for the Capitals, helping them win the last of their record six WTT titles in 2007. Both Warburg and Schnack won NCAA titles at Pacific-10 Conference schools and graduated. Warburg captured the 2004 doubles title with Stanford teammate KC Corkery, and Schnack helped UCLA earn its only women's team title, in 2008. Warburg graduated in communications, Schnack in sociology. Warburg, 29, works as a venture capitalist in the San Francisco Bay Area. Schnack plans to attend nursing school in the fall or next January. The biggest difference between Warburg and Schnack, who do not know each other well, is that Warburg vowed never to return to pro tennis. Schnack already is having second thoughts. "I'm sad to be gone from it," she admitted. "I really do miss it, which is why I've been playing these little opens, so I still can use the competitiveness that I have in me and go out and play and have fun." Schnack left the door open to returning to the tour. "I'm young enough and still have the time to go out and give it a little while, but I'm happy with where things are in my life, and I like the direction it's heading," she said. "I wonder if I do go back and play if it's going to be an emotional roller coaster again. Of course I'll have the highs and feel great and love that I'm back playing, but then there are going to be the lows, and I'll think, Why am I wasting my time? "You know that cycle. I've gone through that with tennis my entire life. I think it's nice to have consistency and routine and not this up-and-down struggle." BNP Paribas Open at Indian Wells -- Kevin Anderson and Mardy Fish, two part-time Capitals in 2012 who are coming back from health problems, won Monday. Anderson, playing in his second tournament after undergoing right elbow surgery, routed 31-year-old Jarkko Nieminen of Finland 6-3, 6-1 in the third round. Anderson, a 6-foot-8 (2.03-meter) right-hander from South Africa, will face 13th-seeded Gilles Simon of France on Wednesday. Fish is competing in his first tournament in six months after battling an irregular heartbeat. The wild-card team of Fish and fellow American James Blake reached the doubles quarterfinals with a 6-3, 6-3 victory over Feliciano Lopez of Spain and Milos Raonic of Canada. Fish, seeded 32nd in singles, will meet eighth-seeded Jo-Wilfried Tsonga of France today in the third round. In a second-round doubles match consisting of the entire U.S. Davis Cup team that beat Brazil last month, top-seeded Bob and Mike Bryan dismissed 6-foot-9 (2.06-meter) John Isner and 6-foot-6 (1.98-meter) Sam Querrey 6-3, 6-3. Querrey also played part-time for the Capitals last year. The 34-year-old Bryan twins, who grew up about a two-hour drive west in the Los Angeles area, seek their first Indian Wells title. Pacific def. Texas-Arlington 4-0 in Stockton. No. 1 singles: Sem Verbeek (P) led Yauheni Yakauleu 7-6 (2), 1-0 (did not finish). Ms. Schnack professes to be lonely, but I can imagine a lot of folks volunteering to keep her company. Yowza.